Disney's Cinderella is full of magical, dazzling imagery, none more iconic than the sparkling glass slipper. 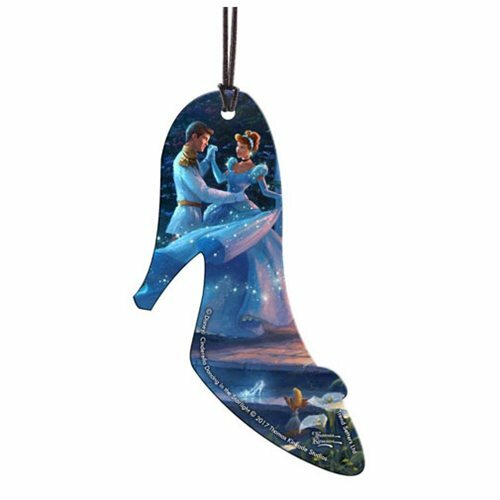 This Disney Cinderella Dancing in the Starlight Hanging Acrylic Print is shaped like Cinderella's slipper, but there's more magic to be found within the silhouette! Cinderella and the Prince twirl and gaze happily at one another, surrounded by the enchantment of romance and her icy-blue gown. On the cobblestone step, sits the glass slipper itself, near one of Cinderella's fuzzy little helpers. This captivating image by Thomas Kinkade Studios is full of color and detail, and the art is fused directly and permanently into the acrylic, creating a light-catching piece that's visible from both sides. It's perfect for any Disney lover or Thomas Kinkade fan and looks wonderful on a Christmas tree or as year-round décor. Hanging string included.